How To Do Email Migration From Thunderbird To Outlook? Everyone is familiar with Thunderbird by Mozilla; it is one of the most flexible desktop email applications available today. 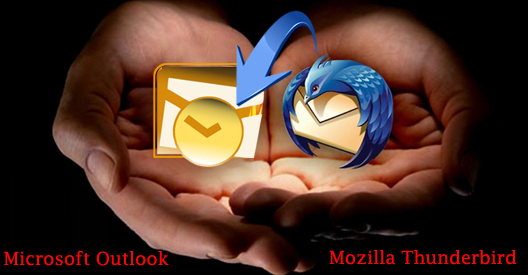 Many organizations are using this email platform since it is a freeware application and supported on multiple OS, i.e. Windows, Linux and Mac. However, as an organization grows, requirements for a more powerful and robust mail client may be necessary to met certain organizational needs. In this case, switching from Thunderbird to Outlook makes the most sense. Let us explore what Thunderbird is and why there is a need for people to switch or choose PST (Outlook) over a versatile format like MBOX (Thunderbird). In addition, readers will learn how to migrate from Thunderbird to Outlook in a few simple steps. Thunderbird is newsfeed client, chat client, newsgroup client, and, of course, an email client. Currently, it is the only flexible mail client as it supports different operating systems as mentioned in the start. Thunderbird contains many features such as: capability of holding more than one email account configuration, support for IMAP and POP protocols, message filtering, etc. Although, it has all these features , many still prefer the Outlook platform over Thunderbird. But why? The following section will will show you why and how to move from MBOX to PST. Though Thunderbird contains many good and sufficient features, it has certain disadvantages. RSS feed reader not seamlessly integrated. Does not show posts, related messages, etc. Difficult to include more security features. No built-in calendar and task management. Outlook is a personalized email client from Microsoft and supports emails, contacts, calendars, notes, etc. It is an efficient standalone application. All the information is stored in Personal Storage Table (PST) file and in OST file format during Offline mode of Exchange server. Outlook is available in many versions and each of the versions differs in content and quality. And the latest version deployed by Microsoft is Outlook 2016. Outlook support Exchange server as well as SharePoint server. Outlook supports POP and IMAP protocols. It has to-do lists, journals, calendars apart from email. It has efficient spam filtering technique, Search filters, etc. Outlook is provided with mail grouping for efficient mailing. So now you want to switch form Thunderbird to Outlook? There are many possible way to convert MBOX file to Outlook. On Outlook, create a ‘New folder’ and open it. Open the renamed folder, drag, and drop the files exported. NOTE: As long as Outlook is set as the default client, double clicking on EML files will open them on the respective client. However, opening them from the folder in Outlook will be troublesome. If you come across many hurdles while following the procedures manually, you can always use a third party software, which is a more efficient way. Thunderbird to Outlook Converter is an apt tool for conversion. The tool is useful for converting MBOX file to PST and also support the conversion to other file formats such as as EML and MSG without the aid of MS Outlook. The user can import the converted files to Outlook whenever time permits. This is a very easy way to migrate Thunderbird data in MS Outlook. But in this way, you may have to face issues or some drawback holes like email structure, rich text formatting, change file extensions and broken images etc. When I was facing this problem, I used Mailsdaddy Thunderbird to Outlook Converter. This is a very effective and reliable tool in my knowledge. The features of this tool are amazing and quickly migrate Thunderbird to Outlook. I’m happy to use it.